Cuprate crystals consist of layers of copper oxide interleaved with layers of other atoms. Copper and oxygen atoms usually form a pyramid with the oxygen atom at the apex located in an adjacent layer. Cornell research now shows that other atoms pushing that oxygen out of position creates superconductivity. New experiments at Cornell have verified a theory that variations in the distance between atoms in cuprate superconductors account for differences in the temperature at which the material begins to superconduct. A better understanding of the process could lead to superconductors that work at higher temperatures. The research is reported in the March 4 issue of the Proceedings of the National Academy of Sciences. Superconductors are materials that conduct electricity with virtually no resistance. While many superconductors work only at temperatures within a few degrees of absolute zero and must be cooled with liquid helium, a class of copper oxides known as cuprates, containing "dopant" atoms of other elements in addition to copper and oxygen, superconduct at temperatures ranging from 26 to 148 Kelvin (-248 to -125 Celsius) and can be cooled with less expensive liquid nitrogen. But no one has explained the wide variation in superconducting temperatures, which vary with the combinations of impurities added to the copper oxide. 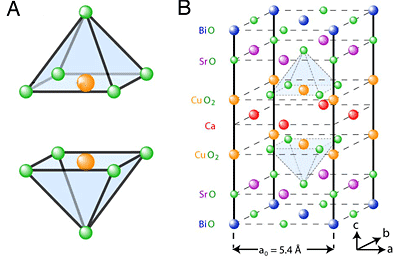 Within most cuprate crystals, the copper and oxygen atoms are arranged in pyramids, with an oxygen atom at the apex. Theorists have proposed that superconductivity can be modified when dopants alter the crystal structure and push this apex-atom down or sideways, changing the way its electrons interact with those in the atoms in the pyramid base. To test this idea, a Cornell team led by James Slezak, a graduate student working with J.C. Séamus Davis, Cornell professor of physics, studied a cuprate whose crystal structure varies in repeating waves across the crystal. Using a scanning tunneling microscope that can resolve subatomic distances, the researchers compared a physical image that showed the periodic rising and falling distances between atoms in the crystal with electrical signals that represent the pairing of electrons. Indeed, electron pairing was stronger in places where the oxygen atom was squeezed down. Theory says that superconductivity happens when electrons join into pairs that can move through the crystal more freely than single electrons. "This proves that gluing the pairs together is a property of each crystal unit cell, not an overall property of the material," Davis said. The researchers also verified that electron pairing is more likely in the vicinity of dopant atoms, at completely random locations in the crystal. Both effects are taking place at the same time, Davis said, and both result from the squeezing of the copper-oxide pyramid. "You don't need two different explanations," he said. Co-authors of the paper include Cornell postdoctoral researcher Jinho Lee and graduate student Miao Wang as well as scientists at the University of Colorado, University of Florida, University of Copenhagen and University of Tokyo. The research was supported by the National Science Foundation, Brookhaven National Laboratory, the Office of Naval Research, the Japanese Ministry of Science and Education and the Japan Society for the Promotion of Science. instead of in a predictable manner.